Hancock Fabrics online at HancockFabrics.com is committed to being the inspirational authority in fabric and sewing, serving creative enthusiasts with a complete selection of fashion and home decorating textiles, sewing accessories, needlecraft supplies and sewing machines. Save on your next purchase from HancockFabrics.com with Hancock Fabrics discounts, Hancock Fabrics coupons, Hancock Fabrics promotions and Hancock Fabrics savings from 58coupons.com. Hancock Fabrics is offering up to 70% off on clearance fabrics. Click link to see what they have! HancockFabrics.com is offering free shipping on orders of $60 or more. Click link to start shopping. 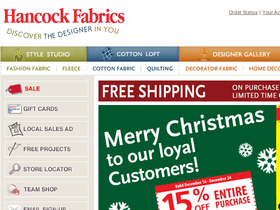 Save $5 on your purchase of $50 or more at Hancock Fabrics when you use this coupon code at checkout. Click link now. Check out the sewing machines at Hancock Fabrics to save up to 35% off the retail price. Click link to save. Stock up on a great selection of fabrics at a 30% discount while supplies last at HancockFabrics.com. Click link to shop.